ABS-CBN Store gives out cool and exclusive treats to SKY and Destiny Cable subscribers in celebration of SKY’s 25th Anniversary. 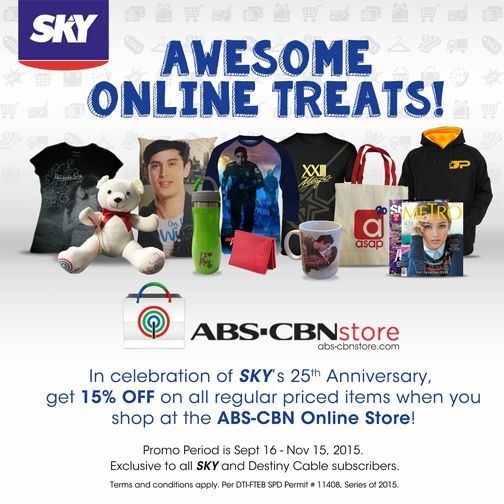 SKY and Destiny Cable subscribers nationwide get 15% off on all regular priced items when they shop at the ABS-CBN Online Store until November 15, 2015. The ABS-CBN Online Store carries all merchandise of ABS-CBN ranging from the must-have Kapamilya Primetime Bida collection such as “On the Wings of Love” and “Pangako Sa’Yo” items to the latest ABS-CBN Publishing magazines and movie merchandise like the “Just the Way You Are” fanzine. The 15% discount applies on all regular items except for CDs, DVDs, and the ABS-CBN TVPlus box. Subscribers who have a good credit standing simply need to input their account number on the coupon code at the checkout page to avail the discount.